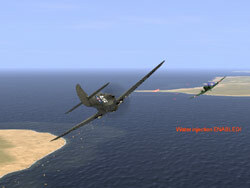 When IL-2 was initially released it was considered a graphical marvel. 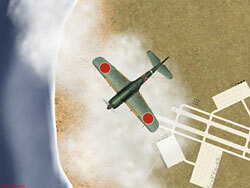 The game brought so many new innovations to the game; things like custom skins, specific markings for individual aircraft, fantastic looking clouds and realistic looking terrain. The aircraft looked photo realistic, the cockpits better than anything ever created and the overall immersion in the game made the most realistic looking simulation to date. Forgotten Battles and AEP improved somewhat on the graphics, taking more and more advantage of the newer graphics cards being produced but overall the looks of the game remained similar to the original game. Pacific Fighters continues the look — which is good and bad. The game still looks pretty decent overall and is comparable to most of the newer engines that have been released. It isn’t quite as good as LOMAC or CFS3 (in some respects) but it still looks good and gives some other newer sims a run for its money. That doesn’t mean that the game engine hasn’t started to show some wrinkles. The game looks pretty good at medium angles and isn’t too bad down low but the weakness of the graphics engine, and the thing that was exposed in AEP was the high altitude look of the game. IL-2 was never really designed to simulate high altitude fighting and in Pacific Fighters the limitations, at least graphically, show. The sky and terrain at twenty thousand feet look more like fifty thousand feet. Some of this is the limited ability to draw long distance terrain. Aircraft continue to look excellent and border on photo realistic. There are games that render aircraft with more polys but I still have yet to find a game that renders aircraft in a better manner. The aircraft just ‘feel’ real. The details of the aircraft continue to be amazing. 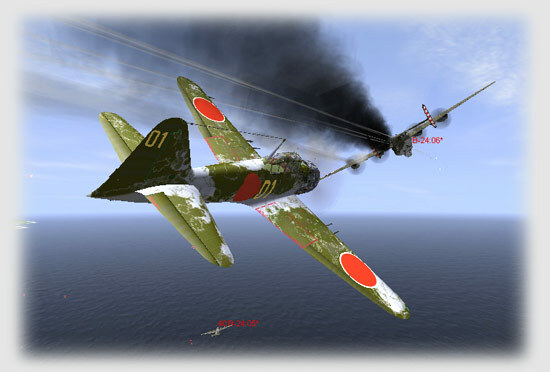 The differences between models of the F4F are detailed in the game. The renderings of the cockpits are just as good. Many of the cockpits were created by private individuals for use in the game but unless you have followed the game from start to completion you would be hard pressed to figure out which ones were made by whom. 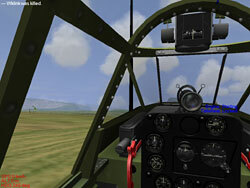 The terrain looks pretty much like IL-2:AEP with a few graphics tweaks and additions that bring it to the Pacific. While in general the terrain looks good and works to maintain immersion, the buildings in the game fail to thrill me like they did a couple of years ago. Don’t get me wrong, the game still looks good and flying down low still gives you that sense of speed and altitude that is essential for a good air-to-ground combat simulation. Unfortunately, when you compare it to games like LOMAC some of the buildings and terrain effects look dated. This isn’t a slam, it was an eventuality that the game would lose its cutting edge looks. It still looks good, it just doesn’t look as awe inspiring as it used to. Water effects continue to shine in the game. For folks with the latest NVIDIA graphics cards, the water effects are simply amazing. For the rest of us, you get decent looking water effects. Radeon 9800 Pro owners can get a dll to install in the PF directory (or IL-2 depending on install) which adds some of the water effects that NVIDIA players enjoy. It doesn’t look quite as good but is passable and enjoyable. Overall I have to say that graphically this is about as good as it gets for the IL-2 series. While the engine shows its age, a little at least, it still is as good as any simulation released in the last two years and still better than most. One thing to note with the game is that it continues to look fairly decent on medium to medium high end machines. A player with a Pentium 4 1.5 GHz and a GeForce Ti4600 will get very respectable performance out of the game. Guys with the latest hardware, i.e. the GeForce 6800 Ultra series, the latest Pentium 4 processors and the max amount of RAM will be able to max it out. At its maximum resolutions and graphics settings, the game looks outstanding. At lower settings it still looks good. Graphically you can’t ask for much more than Pacific Fighters delivers.